What is a Pocket Trainer? These potty training pants are completely waterproof through the wet zone, but made with super stretchy side tabs for easy on and off action. This makes them very versatile and super easy to use! They are reminiscent of the cloth pocket diapers that are ever so popular. These training pants have a layer of micro-fiber built in, making them suitable as a trickle trainer, but a pocket that runs the entire front to back length. 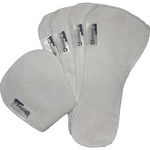 Use our Step-up Inserts to boost absorption as needed. Now MOM can take full control of her potty training plan, and the natural consequences of an accident as she is ready. They make the child feel wet when there has been an accident. Pockets cause an easier transition from cloth diapers into the potty training mindset. Pocket trainers can make use of step-up inserts for added absorbency, but so can the Pull-ons. Pocket Trainers allow for easier snap-on/snap-off mess free handling for mom. If you plan on using more than 1-2 inserts, you may wish to increase the sizing suggested in the size tab. Do you really need potty training pants? 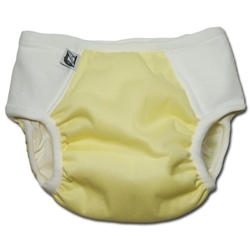 Cloth potty training pants help to combat the disposable trap mothers can fall into. The disposables take awareness of elimination away from the child, leaving you potty training with nothing more than communication. Cloth potty training pants help give moms another tool to use in their potty training arsenal. Now children can feel wet, and you can still be communicating.